I'm sure I've said it before, but I'll say it again: breakfast and brunch are my favorite meals, especially when it comes to entertaining. Dinner parties are fun, lunch is cute, but there is something so cozy and friendly about brunch, and I love waking up to bake muffins or whip up a batch of buttermilk pancakes. This weekend we had some friends over for brunch, and kept it simple with scrambled eggs, toast, and the newest addition to our morning repertoire: fresh-from-the-griddle English muffins. The best thing about the muffins, though, is that they don't just have to be an entertaining-only affair. They are definitely impressive and delicious, and yes, they do require a yeasted batter, but I'd be so bold as to say that they are actually easier to make than a regular batch of pancakes. I guess that's why I've made them three times in the past two weeks. The only "rise" they need is a quick 45-minute rest, which happens to be the perfect window for checking email (or if you're me, about 1000 food blogs), and whisking a few eggs or making some oatmeal. The best part about these muffins, though, is that they are cooked on a griddle instead of baked. Plus, the batter is wet and malleable enough that you don't need to roll them out - just drop a puff of dough on the griddle and you're good to go. Sure, they come out a little irregularly shaped, but that's never stopped anybody from eating them as far as I can tell. 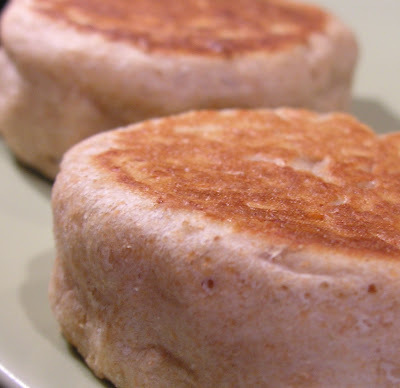 These English muffins are worlds better than anything that you can buy in a store. 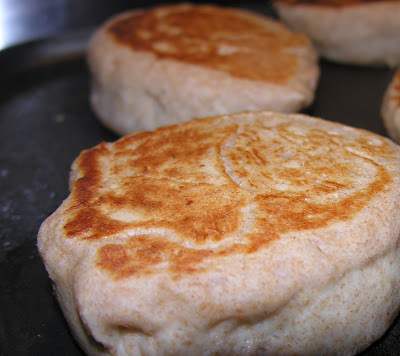 Fresh off the griddle, they are warm and steamy, with a soft, chewy interior. Forget nooks and crannies - these muffins have supple peaks of yeasty dough tucked between lightly crisped edges, browned and golden from the heat of the griddle. They can, theoretically, be split and toasted or slathered with jam, but Jonathan insists on eating them plain. The flavor imparted by a generous amount of yeast, a touch of whole wheatiness, and a bit of sugar is surprisingly robust. In the spirit of giving credit where credit is due, the recipe I use is adapted from a recipe I found on the excellent baking blog, Baking Bites. 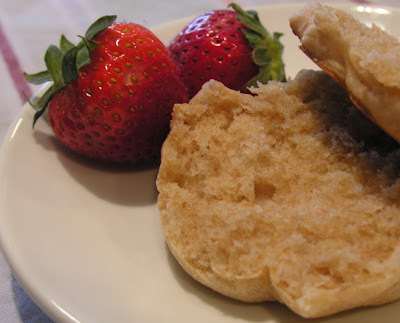 It is one of the only recipes I found that doesn't require several rises, the use of elusive English muffin rings, or other wildly inconvenient processes that would make these prohibitively involved for an everyday breakfast item. My only modification is to substitute a cup of whole wheat flour for one cup of regular white flour. I've made them both ways, but whole wheat flour lends a heartier taste, in addition to a few grams of my favorite nutrient: fiber. The only mildly challenging part of this recipe is the cooking. If the heat under the griddle is too high, you'll end up with a burnt exterior and a slightly underdone interior. I use relatively low heat, allowing the griddle to heat up just until some water sprinkled on it sizzles and evaporates. Once you drop the dough on the griddle, don't move it for a few minutes, flipping it once the underside is golden brown and the sides of the muffin are starting to dry out. The muffin is done when both sides are golden brown and the sides are dry to the touch, about 5-8 minutes total. I love this recipe for many reasons, but here are the ones that will convince you to try it: 1) it only has 5 ingredients that don't come from the faucet 2) it yields a yeasty, bready flavor with only a 45-minute rise 3) it is in no way similar to anything store-bought 4) the muffins are delicious and healthy without the use of any dubious "substitutions." Enjoy! Whisk together flour, yeast, salt, and sugar in a large bowl. Warm the water and milk together in the microwave until warm, about 45 seconds. Mix the liquids into the flour, stirring with a wooden spoon to combine thoroughly. Beat until well-mixed, about 30 seconds or so. Dough will be wet (much wetter than most bread doughs). Cover bowl with plastic wrap and a tea towel, and set aside to rest for about 45 minutes, until puffed and bubbly. To cook the muffins: heat a griddle or skillet over medium heat until water sprinkled on its surface sizzles and evaporates immediately. Lightly grease with cooking spray, and then drop big spoonfuls of the dough onto the griddle using either a greased spoon or a greased measuring cup (I use a 1/3 c. measure). Cook until golden brown, and then flip and cook until sides of muffin are dry. They are best eaten fresh, but keep very well in a zip-top plastic bag for a day or two. I know they're so easy that you don't have to do this, but I wonder how well they would freeze? They were delicious when I had them last time; make them for me again when I get home! These look amazing, absolutely perfect! I'm not sure about freezing, because we always eat them all without having to freeze any....but I think they would freeze pretty well (I do freeze lots of other things, like scones and pancakes). I would wrap them individually in plastic wrap, then in foil, and then put them all in a big zip-top bag. I just made scones on the griddle! 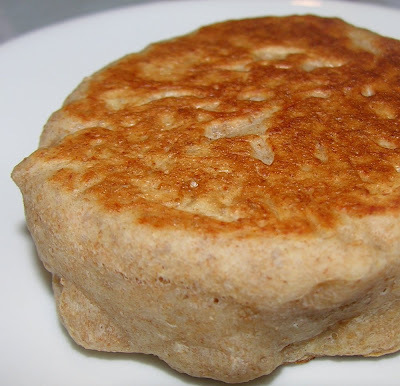 The recipe doesn't have any yeast, and surprisingly enough, has less sugar than your English muffins (but more flour). They also have buttermilk...yum.